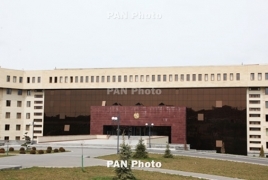 PanARMENIAN.Net - Armenian servicemen have prevented Azerbaijani troops’ attempts to carry out engineering work and bring their positions closer to the border. The incident occurred on Tuesday, March 26 near the Armenian border village of Berdavan in Tavush province. Failing to heed the Armenian side’s warnings, the Azerbaijani soldiers opened fire towards the Armenian troops who retaliated, causing the suspension of engineering work. No casualties have been reported on the Armenian side. 104 years have passed since the beginning of the Genocide, one of the most horrible and shameful pages in the history of humanity. Bloomberg's new article features 15 photos of things to do and experience in the "electric" country. Powerful torchlight procession will mark Armenian Genocide anniv. This annual procession is the symbolic part of the struggle for the global recognition of the mass killings. "The re-equipment of the airbase with Su-30SM fighter jets is planned to start next year," a source said.